Helsby members were out at Delamere, Widnes and Warrington Parkruns. The stand out performance was Colin Bishop winning at Widnes. Full results for Helsby runners can be found at the link below. Colin also ran the Bispham 10K where he finished 4th overall, win his age category and was 2nd placed Northern Vet in a time of 35:57. Great going, Col! Pie and Peas 5 miler. 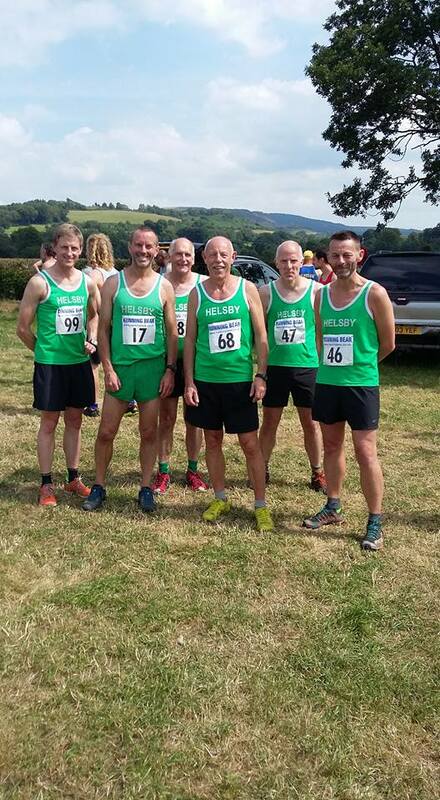 Helsby secured the inter club Fell championship at Tegs Nose with Jim O’Hara first home for the club. Well done to everyone who participated in the race and the championship overall. A short report and full results can be found at the link below. 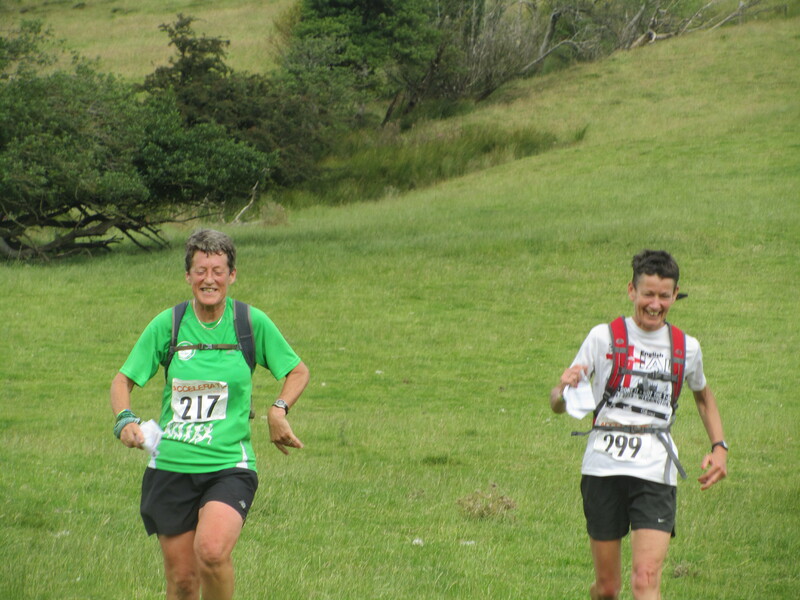 This Saturday, a little to the east of the Teggs Nose race, was the Long Tour of Bradwell Ultra race;a race recommended by Andy in his January talk on ultra running. Easy to say, yes lets have a go and enter; much harder to accomplish. 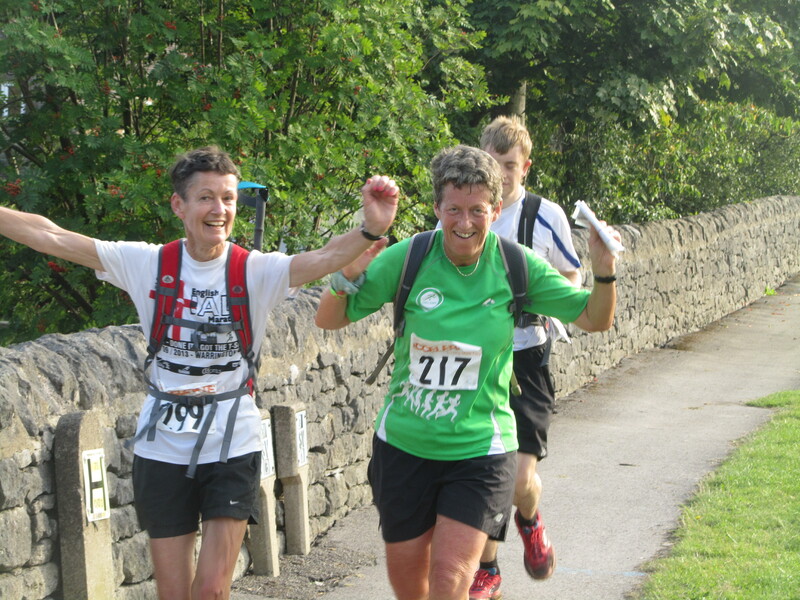 Lesley and I decided to run together this “short” ultra ”very tough 33 mile 6300’ trail/fell run in the Peak District”. With a sunny hot weather forecast we set off in hot windless conditions, even at 9 am in the morning, in search of the 16 dibber points along the route. The first half was a helter- skelter ride. A climb up behind the cement works from Bradwell to Pin Dale and down slippery Cave Dale (where I caught up with Lesley who had already fallen badly with cuts and bruises). Down into Castleton and on through the still quiet streets heading for Hollins Cross (the saddle between Mam Tor and Losehill).Then immediately dropping into Edale which was by now hotting up with tourists and walkers. Fortunately haze and light cloud cover suddenly appeared which made the climb up towards Ringing Rodger much more bearable. A quick search for the checkpoint on the Druid Stone and then a direct pathless descent back into Edale. Helpful waves from Bill and friends Sarah and Andy guided us (and other runners) down to the correct exit point for crossing Edale to take the steep climb back up to Lose Hill itself. A sweaty long down hill section towards Hope with church bells ringing (must have been a wedding) before turning back up to climb the shoulder of Winn Hill and onto LadyBower reservoir where our “surprise surprise marshals” greated us yet again. This time with hot cups of tea and homemade ginger biscuits which just hit the spot and galvanised us for the final trot along the railway line to checkpoint 9, (the half way point with half an hour to spare from the 2 pm cut off). Just before this other fell runners assured us we would make the cut-off and that thankfully the second half was less hiller that the first! Through the picturesque mill grounds of Bamford and a long but steady climb up to Stanage Edge. I was really looking forward to this bit for its airy views and refreshing breeze, but underfoot hopping from flat boulder to boulder was a bit technical for my weary legs and involved too much staring at the ground. Lesley skipped ahead but then was met once again by our surprise surprise marshalls half way along the ridge. A brilliant boost for the next section. We got a bit carried way with the sight of cars ahead and dropped off the ridge too soon to get a little confused as to where the next checkpoint was but some kind cyclists directed us to Burbage Bridge. A little bit of time lost but the next section was a wonderful wide flat gradual downhill track to Pately Bridge. Here there was a fleet of ice cream vans, hundreds of folks paddling in the stream, lots of BBQ smells (it was 4pm by this time) and everyone encouraging us along the way. Down to the river near Hathesage with another surprise surprise greeting from our picnickers sat in an ideal setting by the cool river. Then the final climb up through the picturesque Bretton and Abney Cloughs before the last steep descent back into Bradwell. Except race tape (which we had followed reliably in the tricky navigation parts all day) suddenly led us off to the right and back up hill. Like zombies we followed to be greeted by 3 runners who had done the same and climbed back up before realising this just could not be right. We all about turned, gathering those who were behind us all and all staggered into Bradwell and finally to the finish line where our support team greeted us! An extra mile must have been added on, which at this stage was horrendous; apparently the tape was from the junior fell race the night before, heaven knows why someone did not go up and remove it earlier! A great if a long day out in a stunning running area. At the end I was dreaming of cups of tea and Lesley of Guinness, scampi and chips. We dropped Lesley off at the pub to fulfil her dream whilst waiting for a lift home with Andy (who was having a run further meeting) and we raced back to our friends’ house near Matlock. A cuppa, quick bath and stroll to their local for a meal humanised the day!